Situated on the Montebello Championship Golf Course, Quiet Cannon Conference & Event Center offers elegantly appointed banquet and conference rooms with varying décor and views. We host everything from concerts, weddings, quinceaneras, sporting events, corporate events, social gatherings and much more. At Quiet Cannon, the success of your function is our top priority. Our professional catering and event staff planners are available seven days a week for consultations, event planning, and tours. It is our pleasure to walk you through the planning stages to make your function a huge success. A series of four smaller rooms with capacities from 120 and up, Quiet Cannon Crystal Ballroom combines to seat 1000 guests as one large room, making it the largest capacity room we offer and perfect for corporate, dancing, social, or high-capacity events. Decorated in a traditional ballroom style, Quiet Cannon Crystal Ballroom features beautiful chandelier lighting and warm, comfortable colors adding energy to any event without detracting from supplementary decorations. The Crystal Ballroom has full audio visual capabilities, a number of 70? flat screen displays, as well as large floor-to-ceiling windows and a built-in bar. The Crystal Ballroom also offers an outdoor patio for an ideal pre-event or gathering space. 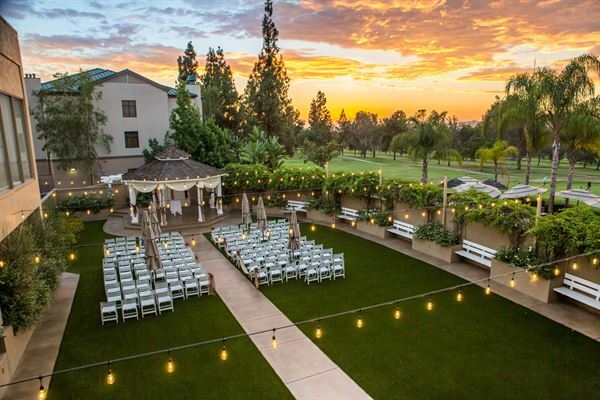 While there are many beautiful locations to say “I do” in Los Angeles, our Gazebo on the Golf Course and accompanying banquet rooms makes for a idyllic, convenient, and affordable way to gather everyone together for the big moment. The Golf Course Gazebo places the bride right in the center of attention for all of the guests – not to mention a memorable outdoor location far removed from the hustle and bustle of the city. The gazebo space can accommodate up to 600 guests for a ceremony. Perfect for more intimate gatherings, the downstairs Salon room is right next to our café for both an ideal pre-event space and complete ease of accessibility. Featuring beautiful lighting and beautiful natural light, Salon Room is an upbeat banquet room featuring seating for up to 80 guests and a view of the golf course. Featuring a full panoramic view facing the golf course, Skyview Room is a distinct and premium banquet room featuring seating for up to 200 guests. The unique architecture provides a great deal of natural light while the decor adds energy to any event without detracting from supplementary decorations. Skyview features a built-in full bar area complete with seating, as well as a beautiful water feature within the room. ewly constructed with premium materials, Spyglass I & II combine to seat a total of 300 guests, or separately 160 guests each. Both Spyglass I & II feature a built-in DJ booth and exotic lighting setups, as well as impressive music capabilities. Spyglass II includes a built-in bridal change room complete with full-size mirrors and a refrigerator. Spyglass I features an impressive built-in bar and built-in dance floor. Both rooms, whether utilized separately or together, create a memorable ambiance and serve as beautiful, contemporary event spaces for your next event. Featuring the same beautiful panorama views as Skyview Room, Sunset features seating for up to 130 guests and offers a beautiful lighting scheme as well as an ideal pre-event space with a built-in bar right outside.